Roll over photo thumbnails to change large image. Photographs by Dave Conlon, Teri Weidner, Jonathan Rissmeyer and Andy Ryan. I.M. 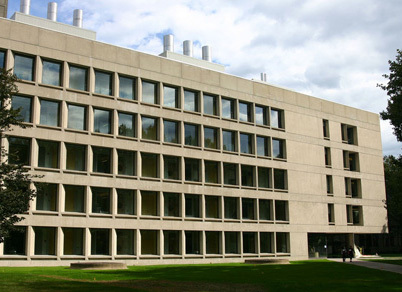 Pei's imposing headquarters for the MIT Department of Chemistry, built in 1967 along with several other modernist buildings on campus, was the scene of many pioneering scientific developments in the last three decades of the 20th century. A comprehensive revitalization by Goody, Clancy & Associates completed in 2003 has made the building ready for a new generation of challenges with state-of-the-art research labs, enhanced safety and environmental systems, and a flexible space format that will allow for reconfiguration as needs evolve. The renovation has given the building a more open plan and increased natural light in the labs. To preserve the integrity of the building the architects worked with Pei 's office on such alterations to the facade as the addition of energy-efficient windows. R&D magazine named the project the "renovated laboratory of the year" in 2004. Construction Quality Manager Jacobs Facilities, Inc.